A family of cooks, sharing recipes. Here's another recipe from my first favorite vegetable cookbook. Betsy has a glut of squash and I am at the beginning of the glut of snap beans at our place. As you can see, our beans aren't all green. I love the purple beans and would love it even more if they stayed that color when they are cooked. They are sturdy plants and productive and easy to see when I'm picking. Bring 2 quarts water to boil in a large saucepan. Add the beans and 1 teas salt. Cook until the beans are tender, about 5 minutes. Drain and set aside for up to several hours. Fry the bacon in a large skillet over medium heat until crisp. Remove from saucepan and drain. Spoon off all but one T of the bacon fat and add the onions. Cook until the onion begins to brown at the edges. Add the beans and parsley to the pan. Toss and heat through. Top with the bacon and season with salt and pepper to taste and serve immediately. Even though I didn't "plant" this butterfly, I have nurtured beds of dill and fennel and kept watch while multiple striped caterpillars chewed on the herbs knowing that this is where they were headed. This morning I found this beauty under my picnic table. Michael and I visited Europe last summer, and my mom came to stay with the boys. She made these muffins and reports that the boys went crazy over them. They still like them. The muffins are best on the first day, but it helps to warm them up later. Also, they are divine with blackberry freezer jam. Preheat the oven to 400F. Spray a regular-size muffin pan with cooking spray and set aside. In a large bowl, whisk together the flour, cornmeal, sugar , baking powder, baking soda, and salt. In a medium bowl, whisk the buttermilk, melted butter, oil, and eggs until well blended. Pour the liquid ingredients over the dry ingredients and mix with a rubber spatula until combined. The batter will be lumpy. Fold in the zucchini, corn, and cheese. Divide the batter evenly in the muffin pan. Bake for 15 minutes, or until the tops are golden and a toothpick inserted into the center of the muffins comes out clean. Transfer the pan to a rack and cool for 5 minutes. Remove muffins from pan and serve. I suppose I first learned about a granita from Alton Brown's show Good Eats. A granita is an Italian frozen dessert and can be made of any number of sweetened liquids including juices, herbal teas, wine, and coffee. A granita is a cooling dessert in the summer but much more enjoyable than a snow cone, because one can avoid the heavy sweet syrup squirted on the ice. It is much more elegant (and flavorful) than a popsicle. Try one of these and if you like it, you can find many more recipes on the internet. Note: the larger the pan you use, the shallower the liquid will be and the faster it will freeze, so if you use a 9X13 pan, check it earlier, rather than later. In addition, the pan can be glass, metal, or plastic, for that matter. I found the following recipe in a book I picked up at a library sale. It allows me to enjoy the best part of a rootbeer float; the crystals last much longer than they do in a the rootbeer. Heat all ingredients in a saucepan over medium heat until the sugar is dissolved. Remove from heat and cool to room temperature. Pour mixture into a 9X13 pan, and place in the freezer and let rest for about 45 minutes. Take a fork and scrape the frozen portions on the edge into the middle of the pan. Repeat scraping about every 30-45 minutes until all you have is frozen bits of rootbeer, rather flaky and grainy, hence the name granita. Serve with vanilla ice cream. If you want a less assertive and acidic flavor than you get from lemon juice or zest, use lemon verbena, an under-appreciated herb. It is a perennial in my garden, growing in a protected, warmer spot. It's leaves are so tough one can't really chop them like parsley, basil, or mint, but it's best to infuse their flavor in hot liquid. It also makes a great herbal tea, iced or hot. Pour the water over the lemon verbena leaves, lemon peel and sugar. Stir to dissolve the sugar and leave to steep for 15 minutes. Strain the liquid through a fine mesh strainer and stir in the ice cubes. When they have melted pour the liquid into an 8X8 or a 9X13 pan and place in the freezer. Allow to freeze for 45 minutes. Scrape frozen portion away from the sides into the center and replace in the freezer. Continue scraping every 30-45 minutes until there are no liquid portions. This can be served as is or with a dollop of creme fraiche or Greek yogurt, sweetened or plain. Combine all ingredients and stir until sugar melts. Pour into a 9X13 pan and place in freezer. Using a fork, scrape the ice crystals that have formed on the sides of the pan and pull them to the center. Return to the freezer and repeat every 30-45 minutes until all is frozen. At that point, fluff the crystals with a fork and allow to "dry" in the freezer for another 30 minutes or so. Scoop into glass bowls or goblets and top with barely sweetened whipped cream with a few thin curls of lemon or orange zest, if desired. In addition to zucchini and other squash, we've had a lot of these little gems around here lately. This is the first year the berries have backed up in my fridge, the first year we haven't been able to just eat them all. And we do eat them! Off the bush, over yogurt, with cream, in brownie sundaes... and in this sauce. The recipe comes from Deborah Madison, one of my mom's favorite cookbook authors. It combines beautifully with a brown sugar cream cake, from the same book. Melt the butter in a skillet or saucepan over medium heat. Add the berries, sprinkle on the sugar, and cook until the berries have released their juices and softened, after about 2 1/2 minutes. Toss them as they're cooking to distribute the sugar. Remove them from the heat and add any of the flavor additions, starting with 2 teas and then adding more to taste. As they sit, the juices will emerge more fully and intensify. Serve warm or at room temperature. This delicious cake took me by surprise; it's sweet and pleasing. 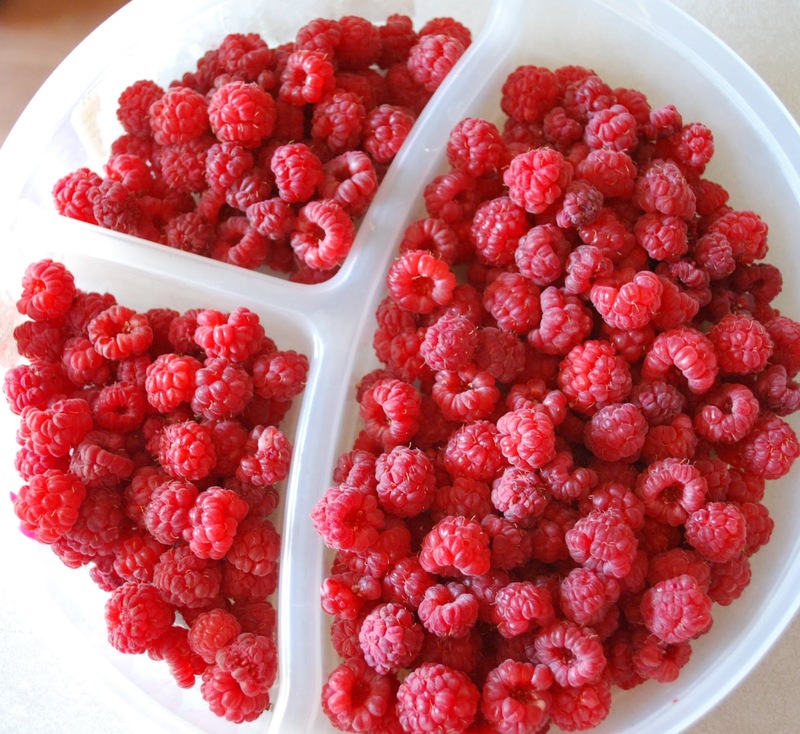 It serves as a tasty base for fruit, fresh or in a sauce, like warm berry sauce. Butter and flour a loaf pan or an 8-inch springform pan. If using a loaf pan, line the bottom and ends with parchment paper. Preheat the oven to 350F. Combine the flours, baking powder, and salt in a large bowl and whisk them together. Make a well in the middle. Using the whisk attachment of an electric mixer, beat the eggs until foamy, then add the cream, sugar, and flavorings. Beat until you have what looks like soft whipped cream. (If using maple sugar, the cream may not thicken, but the cake will still work.) Pour the mixture into the center of the flour mixture and whisk together just until well combined and free of lumps. Scrape the batter into the pan and even it out. Bake until a cake tester (or toothpick) comes out clean, 50-60 minutes. Let cool for 15 minutes, then remove the rim or turn the cake out of the pan and remove the paper. Cool before slicing. Note from Betsy: I don't have a whisk attachment for an electric mixer, so I used the whisks in my Bosch. I mixed on a high speed for several minutes; it didn't quite look like soft whipped cream, but the cake still worked. In a meeting the other day, my library director gave a presentation on decision-making. She used zucchini as an example: "you don't plant three zucchini plants without a plan." She then commented on how we have all been the beneficiaries or the victims of people who planted zucchinis without a plan. Well, we plant four zucchini plants every year, and here's my plan: Cook zucchini every day. Give away the extras, but only to people who truly want it. And, when it gets really bad, take it to the food bank or compost it. Here's a recipe that is a key part of my plan. (I make it year round, as it works really well with frozen zucchini. Just pour off the liquid after it thaws and press.) 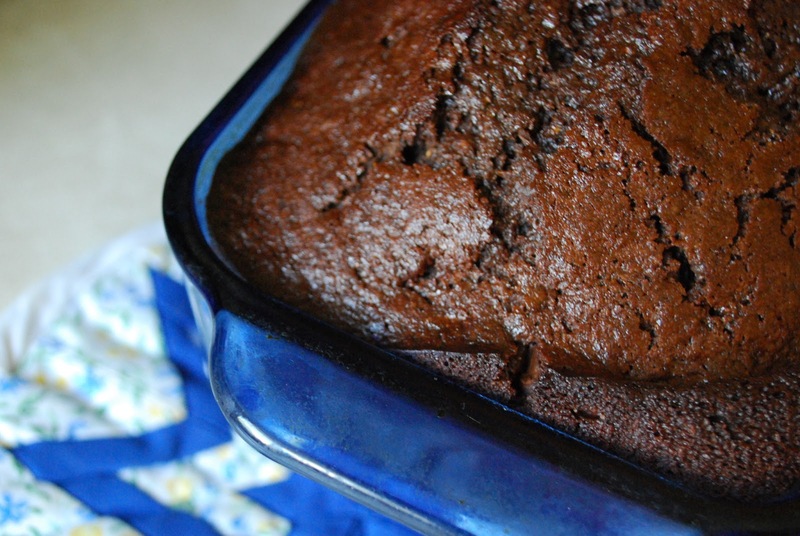 I have tried some chocolate zucchini bread that is dry and tastes nothing like chocolate. But this one is moist and delectable. The espresso powder is optional, but does enhance the chocolate taste. And dark chocolate chips make it especially rich. Preheat the oven to 350F. Beat the eggs, honey, oil, sugar, and vanilla until smooth. Add the salt, baking soda, baking powder, espresso powder, cocoa, and flour, mixing until well combined. Stir in the zucchini and chocolate chips. Pour the batter into a lightly greased 8.5 x 4.5 inch loaf pan. Bake the bread for 65-75 minutes, until the loaf tests done (a toothpick inserted into the center will come out clean, save for perhaps a light smear of chocolate from the melted chips). Remove the bread from the oven, and let it cool for 10-15 minutes before turning it out of the pan onto a rack. Cool completely before slicing. One of the cookbook authors I respect is Rick Bayless. His Mexican recipes are trustworthy and accessible. When his daughter was a teenager, they visited a number of countries and put together this book which is a great one for beginning cooks of any age. I serve these mostly at breakfast, but they make a good dessert following a Mexican dinner. Bring to boil 2 c water and cinnamon stick in a saucepan over high heat. Stir in the rice, cover, and reduce heat to low and cook 20 minutes, stirring occasionally. Remove cinnamon stick. Stir in milk, 1/2 c sugar and 1/4 teas salt. Cook over medium heat, stirring frequently to prevent sticking, until thick, about 15 minutes. Remove from heat and allow to cool slightly. Measure a scant 1/2 c pudding on each tortilla and fold over, pressing gently so the edges of the tortilla almost seal. The pudding will act as a kind of "glue". In a large plate or pie dish mix the remaining 1/4 c sugar and the ground cinnamon. Place a cooling rack over some newspaper or paper towels for draining the turnovers. Heat oil over medium heat in a large skillet until hot but not smoking. Fry turnovers 2 at a time until browned on one side, 2-3 minutes. Use tongs or a spatula to carefully turn them over. Brown on the other side. Transfer to the rack briefly. While still hot, dip both sides of the turnovers in cinnamon sugar and serve. If you don't have canela you can substitute a generous 1/4 teas ground cinnamon. For the cinnamon sugar, if you can't find ground canela, you can grind your own if you have a spice grinder or blender. I advise purchasing a small coffee grinder to use as a spice grinder. They are pretty cheap at garage sales and thrift stores. Whole spices store much longer than ground. I have several coffee grinders so I can grind savory spices separately from sweet spices. These don't have to be made all at the same time. You can refrigerate the pudding and cook later, after allowing the pudding to come to room temperature (or warm it in the microwave). I wouldn't go much longer than 5 days. My husband and I have known a young woman named Margaret since her birth and she is an important person in our lives. When she was a little tyke she loved it when Mr. Spackman would make her some waffles no matter what meal. These are the waffles our young family ate many Sundays when we came home from church. Betsy and I particularly liked these with Nutella and bananas and everyone in the family (except me) ate them with peanut butter and maple syrup. Tom had a friend, Doug, who preferred them with peanut butter, Nutella topped with maple syrup. From Betsy: Also, I lived on these waffles for one semester at college, eating them probably 3-4 times/week for dinner. I'm sure it had something to do with comfort (and ease, since they're so fast to cook). Plug in waffle iron and preheat it. Mix ingredients together in a bowl; batter should be lumpy. Cook on a hot waffle iron. Yesterday we harvested 3 frames from our beehive and now we have 12 more pounds of honey. Even though I understand the science behind the process of honey production, it still seems like magic to me. It is one of the great wonders of the natural world. As a child of the baby boomer generation, I was raised on Campbell's soups which were a staple in my mother's kitchen and truth be told, in my own for many years before I started reading cookbooks. I never really liked them as soups. I thoroughly detested Campbell's vegetable soup, a concoction of extremely overcooked vegetables in water with globs of red grease floating on top. It ruined me on vegetable soups, I thought forever, until I started to try some recipes that are based on fresh vegetables. I cooked this soup this week since I have lots of chard in the garden. It is a good soup for those trying to reduce the amount of meat in their diets. Soak the porcini in about 3 cups of warm water for 30 minutes. Remove the mushrooms with a slotted spoon, reserving the soaking water. Rinse the mushrooms briefly under cold water since they can be gritty. Allow to drain a bit and coarsely chop them and set aside. Strain the mushroom soaking liquid through a sieve lined with paper towels into a bowl and set aside. Heat the butter and oil in a saucepan over medium-low heat and sweat the onion for about 15 minutes, stirring occasionally, until they are transparent and soft. Add the garlic and stir for a minute, then add the mushrooms and cook, stirring for another minute or so. Add the tomato sauce or the tomatoes with their juice, the chickpeas, rosemary, bay leaf, reserved mushroom soaking liquid, and a few grinds of black pepper. Bring to a boil, turn down the heat, and simmer gently for about 45 minutes. Add the greens and cook for a further 2-3 minutes for spinach or 8-10 minutes for chard. If the soup seems too thick, thin it slightly with a bit of water, although don't add much or you'll dilute the flavor of the broth. Remove the rosemary and bay. Taste and season with salt and additional pepper if needed. Ladle into bowls, drizzle some olive oil over the soup and shave over a few slivers of cheese with a vegetable peeler. Serve at once with crusty bread. You could substitute kale for the greens, if that is what you have. The porcini can be expensive--a 1 oz pkg. can cost $4 to $5 on Amazon. But if you figure that meat to flavor a broth would cost a lot, too, maybe you'll find it easier to justify. Be careful of the kind of dried mushrooms you buy. Costco has a big plastic jar full of dried mushrooms, but when I examined them, it seemed apparent they were all stems and very few tops. Dried porcini are among the most flavorful mushrooms you can use in cooking so you get a big bang for your buck. If you decide to substitute another kind of bean for the chickpeas, I suggest you wait to add them with the chard. Other beans may fall apart during the simmering step. I am posting this recipe because zucchini season is upon us. Betsy tested the recipe; I have an ongoing battle with squash bugs in my garden so I haven't tried it yet. I perused the cookbook titled Weelicious by Catherine McCord because I thought it might have some good ideas for foods for kids. It has quite a few suggestions and I'd recommend the book to anyone cooking for small children. That said, I can hardly stand the cheese factor in the book and at the website and I'm not referring to a food item when I mention cheese. However, McCord is making an effort to help children in this country have better meals and I have to admire her for that. For the most part her recipes seem to have considerable merit, even if I often can't stomach (!) her choice of titles. Preheat oven to 450 degrees and coat a large baking sheet with cooking spray. Mix the first 4 ingredients in a bowl. Whisk the egg in a separate bowl. Place the flour in another bowl. Make an assembly line with the bowls, and first dip the zucchini coins into the flour, then the egg and finally into the bread crumb mixture, coating evenly and repeating with all the zucchini coins. Place all of the coins on the baking sheet/rack. Arrange so they’re not touching, spray with oil and bake for 20 minutes or until the bread crumbs are golden. Serve. *After finishing the coating process, place on a baking sheet and freeze for 30 minutes. Remove and place in a zipper bag, label, and freeze. When ready to eat – take them out of the freezer and put them in the oven adding at least another 3-5 minutes baking time. Heat the olive oil in a saucepan over medium heat and saute the onions and salt for 5 minutes. Add the garlic and herbs and continue to cook for 1 minute. Add the tomatoes and sweetener and cook for 5-10 minutes or until slightly thickened. Serve with zucchini coins or other dip-able foods or as a pasta sauce. The zucchini glut has started at my house. We always plant zucchini and yellow squash, but this year we have a number of volunteers, some of which look like a hybrid between zucchini and yellow squash. They are oblong like yellow squash, have a light green (sometimes smooth and sometimes nobbly) skin, and they grow on a vine that is taking over my entire garden. So we have even more squash than usual! Here's a new, easy zucchini recipe, one that will become a staple of my summer meals. My dear friend Susie Heimbach and I have been exchanging recipes for many years now, accelerating recently as we both have young families to feed. She once served me a dish now known in the family as Susie's Pasta (which I will post once I have fresh tomatoes). We don't get to see each other as much as we would like, living on opposite sides of the country, but eating Susie's Pasta always brings back the fondest of memories. And now here's another yummy pasta recipe from Susie. In a large skillet, warm the olive oil over medium heat, then add the onion and cook 3-4 minutes. Slice and quarter the zucchini. Add the zucchini and salt, and cook 15-20 minutes. While the vegetables are cooking, make the farfalle according to the package instructions. In a small bowl, beat the eggs and add the parmesan, then set aside. When the pasta is ready, drain and add it to the zucchini mixture. Remove from heat, and add the eggs, allowing them to cook on the hot pasta. Serve with pepper and extra cheese. This is the last of the garlic harvest of over 300 heads. Harvesting garlic is a pleasant job because of how good it smells. The garlic on the right weighed 6 3/4 ounces and its circumference was 8 1/2 inches. It is among the largest I grew this year. This is a new recipe for me, one I hope some of you will try during this summer's berry season. Blackberries bake well (I cannot suggest a substitute, unless you want to try blueberries). Preheat the oven to 400F. Place a baking sheet on the bottom rack to catch spills, although I didn't see much risk of it overflowing. Place the flour, baking powder, salt, baking soda into the bowl of a food processor and process for 4 pulses. Pour the mixture into a mixing bowl and with a pastry blender or your fingers work the butter more completely into the flour mixture until about half the fat disappears and the rest is left in pea-size pieces. Make a well in the center of the mixture and pour in the buttermilk. Stir with a rubber spatula until it comes together. Store in the refrigerator while you prepare the berries. Over medium-high heat, combine the blackberries, sugar, water and ginger in a saucepan or a 10-inch cast iron skillet. Bring to a simmer and decrease the heat to medium low and continue to cook, stirring occasionally, for 15 minutes or until the liquid is thick enough to coat the back of a spoon. (Check the back of the spoon you've been stirring with. If you draw your finger through the liquid and it makes a definite track, that indicates the sauce coats the back of a spoon). It may seem somewhat too thin, but will thicken a bit more as it bakes. If you are going to bake the grunt in the skillet leave the blackberry mixture where it is. If you are going to bake in a baking dish, transfer the mixture to a buttered 8X8 (or equivalent) oven-safe dish. Drop the dough onto the fruit mixture using a 1-oz disher (small spring ice cream scoop) or a large spoon, evenly distributing it over the top. Do not smooth out but leave in dumpling-like lumps. Bake in the oven for 15-20 minutes or until the top is just starting to brown. Remove from oven and allow the grunt to cool for 15 to 30 minutes, before serving with ice cream (Leon's favorite) or drizzle with whole cream (my favorite--not as sweet). I will likely bake this in a baking dish rather than the cast iron skillet in the future, unless I have company who can help me eat it immediately. The baking dish will better facilitate leftovers. Next time I make this I will use half whole wheat pastry flour in the dumplings/biscuits and I plan to sprinkle the tops with some cinnamon sugar and I will test it with an egg white wash which will hold the sugar on top and allow it to crisp up nicely. I'll let you know how that turns out. This recipe, although baked, seemed to suffer no ill effects from my high altitude. If I travel to a low altitude and have access to blackberries, I'll try it out and see what differences there may be. Apparently there was once a time near Philadelphia there were so many dairy farms that people needed encouragement to use up all the cream and milk produced. Eggs, it seems, were less abundant. Someone figured out a good recipe for vanilla ice cream without a custard base. I like both kinds of vanilla ice cream but this takes less time since the chilling step is shorter (no custard cooking and cooling). I use this recipe when I'm in a hurry. I love the book this recipe comes from and trust the author to provide reliable recipes. I recommend you find this book at the library and take a look at it. There is a sterling recipe for avocado ice cream that is the creamiest ice cream ever. Pour 1 c cream into a heavy medium saucepan and add the sugar and salt. Scrape the seeds from the vanilla bean into the saucepan and add the pod to the pot. Warm over medium heat, stirring until the sugar is dissolved. Remove from heat and add the remaining 2 c cream (or the remaining 1 c cream and milk) and the vanilla extract. Cool the mixture and place in the refrigerator to chill thoroughly 4-6 hours or more. When ready to churn, remove the vanilla pod rinsing and reserving it for another use (such as vanilla sugar--stick it in a jar of sugar and leave for a month or so). Freeze the ice cream base according to the directions for your ice cream maker. When you are finished, either eat as soft serve ice cream or pack in small freezer containers (the more opening and shutting of a container you do, the more ice crystal formation takes place which compromises the texture of your ice cream over time). Also,I find that a sheet of plastic wrap helps reduce the formation of ice crystals. I don't know what to tell you to do if you don't have a vanilla bean. I procured a large supply from the spice souk in Dubai (thank you, Tom). I encourage you to use real vanilla extract and suggest you double it if you don't have a vanilla bean. Try it and let me know if you think it has proper vanilla flavor.You may, once you've made vanilla sugar, use it in this recipe, making it so you can skip the vanilla bean from time to time. You see a fairly large variation in the amount of sugar. I find 3/4 c sugar much too sweet but I think most people won't. Although I love sweet things, too much sugar is distasteful to me unless I can cut the sweetness with something salty or tart or with dark chocolate (not milk chocolate). I lower the sugar in all the recipes in this book, except the avocado ice cream, I think. Although I ate Kraft macaroni and cheese as a child, now I prefer the homemade version. Michael says this recipe has ruined him for any other mac & cheese and I have to agree. Most of the time I use the medium cheddar that I have on hand, and last time we even used some pepper jack. So far we haven't had a bad cheese combination. For the bread crumbs: Pulse bread and butter in food processor until crumbs are no larger than 1/8 inch, ten to fifteen 1-second pulses. Set aside. For the pasta and cheese: Adjust oven rack to lower-middle position and heat broiler. Bring 4 quarts water to boil in Dutch oven over high heat. Add macaroni and 1 tablespoon salt; cook until pasta is tender. Drain pasta and set aside in colander. In now-empty Dutch oven, heat butter over medium-high heat until foaming. Add flour, mustard, and cayenne (if using) and whisk well to combine. Continue whisking until mixture becomes fragrant and deepens in color, about 1 minute. Gradually whisk in milk; bring mixture to boil, whisking constantly (mixture must reach full boil to fully thicken). Reduce heat to medium and simmer, whisking occasionally, until thickened to consistency of heavy cream, about 5 minutes. Off heat, whisk in cheeses and 1 teaspoon salt until cheeses are fully melted. Add pasta and cook over medium-low heat, stirring constantly, until mixture is steaming and heated through, about 6 minutes. Transfer mixture to broiler-safe 9-by 13-inch baking dish and sprinkle evenly with bread crumbs. Broil until crumbs are deep golden brown, 3 to 5 minutes, rotating pan if necessary for even browning. Cool about 5 minutes, then serve. I'm not a fan of tuna salad generally, but this recipe has converted me. My little family doesn't love it, though, so I have to save it for feeding guests. Mix together in bowl. Season with salt and pepper.